A 23-year-old Army medic from Deltona was killed this week while trying to rescue fellow soldiers wounded in an ambush in Afghanistan, military officials announced Wednesday. Spc. 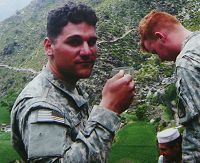 Angelo Vaccaro and another U.S. soldier died Monday near Korengal in eastern Afghanistan when their unit met resistance trying to recover casualties from an earlier firefight. Vaccaro was deployed earlier this year with Company A, 1st Battalion, 32nd Infantry Regiment, 3rd Brigade Combat Team, 10th Mountain Division, out of Fort Drum, N.Y.
Vaccaro had been awarded a Purple Heart last Saturday by Maj. Gen. Benjamin C. Freakley. Two days later, according to the Watertown (N.Y.) Daily Times, the hometown newspaper for the Fort Drum area, Vaccaro was distraught about being away from the front lines while his platoon-mates engaged Taliban fighters. Vaccaro volunteered to help recover wounded compatriots, but when he arrived at the scene he was killed instantly by a rocket-propelled grenade, the Daily Times reported. Linda Vaccaro, Angelo's mother, said her son was the head medic for his unit. He enlisted in the Army in March 2004 to "turn his life around and make something of himself," she said. "He was going to further his nursing career and become a physician's assistant," Linda Vaccaro said. "That was his dream in life." Angelo Vaccaro was a practical joker who liked to make people smile and laugh, his mother said. "He was a loving person, and had a big heart," she said. "There was nothing he would not do for someone. He embraced his family and loved his country. He took pride in what he was doing." Angelo Vaccaro was born in the Bronx, N.Y. He attended Timbercrest Elementary, Galaxy Middle and Deltona High schools -- all in Deltona. Angelo Vaccaro's parents are to receive his remains next week, but the Army will handle the arrangements for his burial in Deltona Memorial Gardens on Saxon Boulevard, Linda Vaccaro said. Besides his mother, Vaccaro is survived by his father, Nelson Vaccaro; his wife, Dana, who is working in Tampa; brothers Vincent, 35, and Ray, 28; and a sister, Christina, 33. "Angelo was the baby," Linda Vaccaro said. "He was quite the soldier, quite the man and quite the son."